For high precision aircraft noise measurements a system has been developed with highly accurate tracking capabilities, based on correlation and nonlinear least square optimization. History and the state equation has been taken into account resulting in an extended Kalman filter optimization procedure. The accuracy is so high that passive ranging is possible for moving and stationary objects, with an error depending on distance, velocity and environmental parameters. These environmental parameters will not be treated. Fig. 1 shows a noise monitoring system with four microphones in a spatial configuration for aircraft. This is the minimum configuration without ambiguity on direction. From the arrival time differences of sound at the four microphones the position of the aircraft is calculated and expressed in azimuth and elevation or relative horizontal coordinates. Signal processing is based on correlation with nonlinear least squares and/or extended Kalman filter optimization. Up to four aircraft can be tracked simultaneously. Fig. 2 shows the weighted pressure of sound as function of direction from a passing aircraft, by measuring and processing the acoustic sound at the four microphones in real time. The sound direction at the shortest distance, in the vicinity of zero, is accurately calculated. In case the azimuth is lower then 15 degrees, the turbulence varies the propagation path. This effect, also present in Fig. 2, is equivalent with that for light over a hot road surface. Due to correlation the influence of rain and wind on these measurements is 24 to 38 dB lower than for single microphone systems, resulting in more accurate sound pressure measurements, but also smaller timing errors. The latter is a prerequisite for range information retrieval. A manuscript about the system has been submitted for publication . The system has also been validated on assignment of the Ministry of Transport, Public Works and Water Management in the Netherlands . Figure 2: Sound strength in dB(A) as function of relative retarded coordinates, measured by the spatial microphone configuration shown by Fig. 1. The vertical coordinate is equal to one. In case of transits of aircraft, Doppler frequency shifts occur. It is clearly heard by most people and it might be possible to relate this shift to the velocity of passing aircraft. With jet engines the noise is almost without dominant spectral lines and the Doppler information is very difficult to retrieve. Even in case of fan propelled aircraft Doppler information is not easily obtained . Due to the high angle resolution of the system, another effect exhibits very strongly, namely angular shifts. Fig. 3 shows the simulation of the sound pressure of an aircraft passing by. The time intervals between the vertical lines are 0.4 seconds. 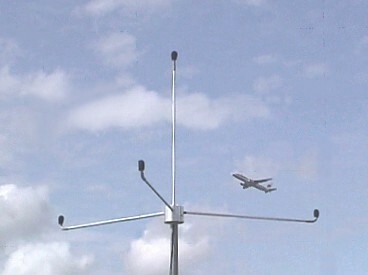 The picture shows the relative horizontal coordinate intervals between adjacent lines, which change as the aircraft flies by. Assuming that the aircraft flies for a short period of time with constant speed and height, the shortest distance to the path and the aircraft velocity can be estimated. The errors in these estimators depend on range and aircraft velocity but also on the environmental conditions. This method cannot be applied to stationary sources. In that case the curvature of the wave front can be used to calculate the range. The latter method is even more sensitive for time measurement variations then the one based on angular shift. Sound from aircraft is modified by the velocity. A retarded acoustic field occurs with an effect which is normally observed as a Doppler frequency shift. The time of arrival of sound is equivalent to the time of transmission of sound plus the propagation time. As the aircraft is approaching, the aircraft is closer to the wave front than when the aircraft is flying away, resulting in an angular shift. One can express this effect as a function of the shortest distance to flight path and of aircraft velocity. Fig. 4 shows the fitted data from fig. 3 by varying the aircraft velocity and shortest distance to the flight path. The fitting is done via a nonlinear least squares method. The errors in the estimated parameters are obtained from the covariance matrix. In this case the error is smaller then 1 %. Fig. 5 shows the fitted real data of fig. 2. It can be seen that some data points at the end of the curve vary more than those in the middle. This is due to the turbulence and longer propagation path especially through the layers more closely to the ground. With stationary sources this technique is not possible. A technique used in the antisubmarine warfare (ASW), measuring the curvature of the wave front, can be used to estimate the range. 3. Ranging by using the wave front curvature. By calculating the propagation times from the source to the microphones, the curvature can be measured. The sensitivity of this method for timing errors can be shown easily . With three microphones on a base of 2*b wide, and the source on distance r , perpendicular to the microphone base, the time difference is: where c is the sound velocity. For a base parameter b = 0.7 m and sound velocity c = 340 m/s , the changes in distance for 1 µs are for distance r = 10 and 100 m, respectively 0.138 m and 13.8 m.
For the x-direction these changes are respectively 0.0024 m and 0.024 m.
In case of passive ranging by submarines, the distance between the hydrophone arrays is 15 m and the sound velocity c = 1500 m/s. For distance r = 1 km and 10 km and a change in time of 1 µs # 1.5 mm, the changes in distances are respectively 3.33 m and 333 m. The variations in propagation path length to the different hydrophones are quite high, so the sensitivity is even higher. 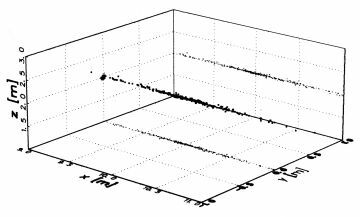 For statistical errors the influence of noise on the measurement is: where is the bandwidth and N/S the inverse of the signal to noise ratio. In case a single datum is taken with a bandwidth of 500 Hz, the required S/N for 1 µs is equal to 30 dB. When all significant points of all correlation signals are used and history taken into account, leading to an extended Kalman optimization technique, the required S/N ratio will be reduced substantially. The sensitivity for systematical errors remains larger, rendering these systems for submarines as at least difficult to operate. Fig.6 shows the results for a S/N ratio of 12 dB. Figure 6: Localization of a simulated acoustic source at position (10,0,2) by passive ranging based on extended Kalman filter optimization. The S/N is 12 dB and the bandwidth 500 Hz. The variation in the x-direction is substantially higher then in the y- and z-direction. By increasing the weight of history, the statistical error in range can be made smaller, but the system errors if present will remain the same. An other option is to move the microphone array or use a second microphone array. The presented noise monitoring system has a very high directional capability. In case of aircraft it might be used to estimate the distance and velocity. For stationary sources the curvature of the wave front can be used for obtaining the range, however with a very large error in range depending on the local circomstances and only usable for short distances such as in classroom demonstrations. Turbulence, which is not treated in this contribution, will have a large influence on the operational range capacity of the system.